Have you heard of stratocumulus clouds? They are essentially dark grey clouds that look a little like rain, but produce none. 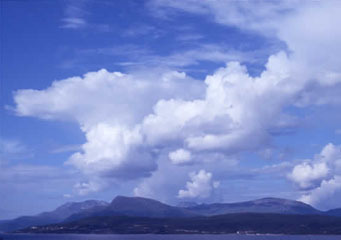 Within this category of clouds, though, there are many different smaller subtypes that have their own particular characteristics. One of these is the stratocumulus cumulogenitus cloud. What are stratocumulus cumulogenitus clouds? Stratocumulus cumulogenitus clouds are a particular type of a stratocumulus clouds that are formed actually from other clouds that are letting loose and dying down. This type is somewhat transient, but because of its particular conditions, it is actually fairly common, especially in the summer months. What height are stratocumulus cumulogenitus clouds found? Stratocumulus clouds in general tend to sit lower than cumulus clouds. This is where the reference to stratus clouds comes from in the name of the cloud. This means, you will only be able to find these clouds sitting fairly low and close to the earth. They are found at roughly a little about 8,000 feet in the air because they are formed from clouds moving downward. These clouds are actually part of a list of particular subtypes of stratocumulus clouds. These actually can form from other cloud types, though, as can be seen with this type and many others. This is technically a form of stratocumulus cloud, but also has features of cumulus clouds. How are stratocumulus cumulogenitus clouds formed? Cumulus clouds can spread out and move downward when the temperature is disrupted and the air begins to cool. This is common before a storm or when the sun sets. Decaying, or breaking up, cumulus clouds can lower in summer evenings and form this particular type as well. Again, this is common in summer evenings. Both of these situations revolve around the temperature dropping from very warm to much cooler, which is a popular occurrence late in spring or late in summer. Stratocumulus cumulogenitus clouds have a very distinctive shape. On top they are large, puffy cotton ball like cumulus sort of clouds. The bottom is not flat and not incredibly heavy. Smaller, darker puffs form the bottom pat of the clouds. It appears somewhat like a pile snow with grey snow at the bottom. How common are stratocumulus cumulogenitus clouds? These clouds are actually one of the most common types of stratocumulus clouds because they regularly form before storms in the spring or at the beginnings of evenings when the sun sets. Since this is something that actually happens quite often, you should expect to see these quite a bit. Where can I see stratocumulus cumulogenitus clouds? Seeing stratocumulus cumulogenitus clouds is a very easy thing to do in summer. You can go outside at the beginning of an evening on a warm day or right before a summer storm. If you look very low in the sky, you will be able to see these dark, puffy clouds scattered in places all over the sky.